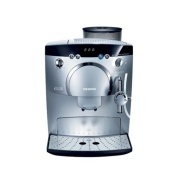 alaTest has collected and analyzed 123 reviews of Siemens TK 58001 Surpresso Compact. The average rating for this product is 4.0/5, compared to an average rating of 4.4/5 for other products in the same category for all reviews. People really like the reliability and price. The durability and design also get good comments, but there are some less positive opinions about the capacity and size. We analyzed user and expert ratings, product age and more factors. Compared to other products in the same category the Siemens TK 58001 Surpresso Compact is awarded an overall alaScore™ of 80/100 = Very good quality. Easy to use. Put the beans and water in, press a button and enjoy a cup of freshly ground coffee. Milk heater/frother brilliant and also very easy to use. Instructions could be better. Water container could be bigger, i seem to be filling it up on a regular basis. Very easy to use and very stylish design. Would argue that it has been very good value for money. Would definitely recommend to other people. It does take a while to get used to using the milk frother. Was a bit confusing at first. If using a large cup the maximum output switch doesnt quite fill up the cup, sometimes have to repeat the process.